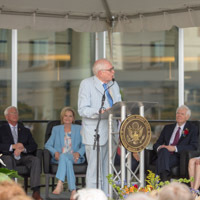 On August 9, 2018, the United States District Court for the Southern District of Mississippi, joined by United States Senator Roger Wicker and United States Senator Cindy Hyde-Smith, as well as the United States General Services Administration, held a ceremony commemorating the naming of the Thad Cochran United States Courthouse. 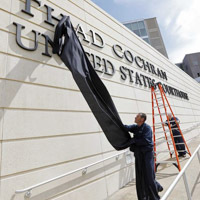 Congress officially named the Courthouse earlier in the year, honoring the recently retired United States Senator. 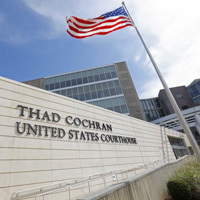 Senator Cochran had a hand in nominating and securing Senate confirmation for every District Judge currently in service on our Court, as well as each of Mississippi’s four judges on the United States Court of Appeals for the Fifth Circuit. All of those judges have chambers in the Courthouse, which was constructed with funding obtained, in large part, through the efforts of Senator Cochran. 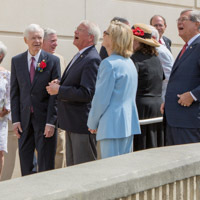 Prior to the ceremony, Senator Cochran and his wife, Kay Webber, met with the Southern District Judges and toured the Courthouse. 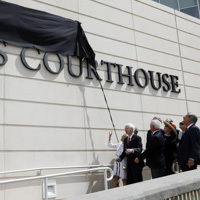 Although the heat and humidity were typical for Jackson in August, the rain held off, and, the Courthouse’s new name was officially (almost) unveiled in the front of the building. It quickly became obvious that what began as a routine, “pull on the rope, and the covering will fall off” mission was going to be unsuccessful. Apparently the cloth was affixed too tightly to the new sign, but Senator Cochran took it in stride. Ultimately, the sign was fixed the old fashioned way. 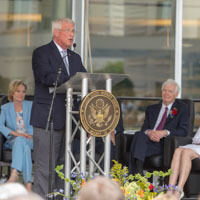 After the unveiling, several hundred guests moved to the building’s rotunda to hear Grady Jolly, Senior Judge of the Court of Appeals for the Fifth Circuit, speak on behalf of the Senator’s family. 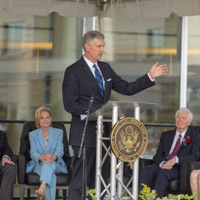 Governor Phil Bryant also attended, as did retired Senator Trent Lott and many state and local officials. Following brief speeches by Chief United States District Judge Dan Jordan and others, the guests were welcomed inside for a reception. 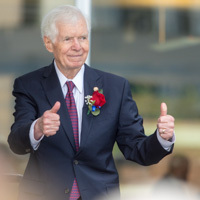 All’s well that ends well, and the employees who work at the Thad Cochran Courthouse are honored to be in a building named for such a distinguished public servant.